In a one-piece 53.3 x 36.3mm polycarbonate housing, that fits into ‘0U’ and ‘1U’ racks. Threaded mounting studs and caged terminal blocks are intended to ensure reliable operation in harsh environments. 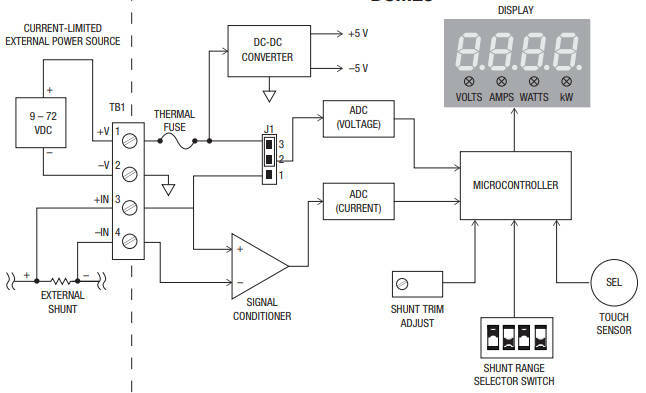 When powered from the sensed rail, measurable voltage range is 9 to 72Vdc. Current consumption is typically 6mA at 12V or 2mA at 72V, described as “generally negligible compared with measured current” by the firm. A separately-supplied external shunt resistor is needed for current measurement (Murata offers suitable parts, see data sheet), and the meter supports 16 full-scale ranges from 5A to 1,200A, chosen using a DIP switch (sense voltage is 50mV or 100mV). For calibration against different shunts, a potentiometer is provided. The external shunt resistor may be placed in either the ‘high’ or the ‘low’ side of the power system, within the DCM20’s 72V common-mode range. A jumper is available to set where voltage is actually measured, either remotely or at the shunt resistor. 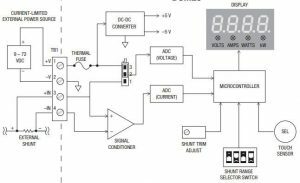 “In this way, high or low side current sensing is practical and power measurement can exclude losses in wiring and the shunt resistor itself,” said the firm. Out-of-the-box accuracy of the product is +/-1% for voltage and +/-2% for current. A capacitive sensor is built-in to the front-panel for selecting operating mode, “avoiding wear-out issues possible with membrane of other mechanical switches”, said Murata. The display can either be manually switched between voltage, current and power views, or automatically cycle between them. LEDs beneath the numeric display indicate which quantity is being measured. Intended usage is in laboratory instrumentation, industrial equipment, telecoms equipment power distribution, battery management, battery back-up, alternative energy and marine installations. The best smart speakers 2018: which one should you buy?